Background: Data suggest that postmenopausal women with osteoporosis are at an increased risk for periodontal attachment loss and tooth loss; however, the extent of relationship between these two diseases is still not clear. Aim: The aim of the study was to evaluate the correlation of periodontal status and bone mineral density (BMD) in postmenopausal women. Materials and Methods: The study population included 60 postmenopausal women aged 50-60 years (mean±SD: 55.5±3.4 years). Periodontal status was examined by plaque index, bleeding index, probing depth, and clinical attachment level (CAL). Digital panoramic radiograph was taken to measure the maxillary and mandibular alveolar bone density values. Skeletal (calcaneal) BMD was measured by quantitative ultrasound technique for T-score values. The recorded data for T-score, maxillary and mandibular alveolar bone densities, and periodontal status were subjected to statistical analysis for correlation and regression procedures. Results: The results showed that mandibular alveolar (r=0.907, P<0.001) and maxillary alveolar bone density (r=0.898, P<0.001) had significant positive correlation with calcaneal T-score. Probing depth (r=-0.316, P<0.05), bleeding index (r=-0.277, P<0.05), and plaque index (r=-0.285, P<0.05) showed weak but significant negative correlation with calcaneal T-score and alveolar bone density of both the jaws, whereas CAL showed weak correlation with T-score which could not reach to a statistically significance level (r=-0.221, P>0.05). Conclusion: Calcaneal BMD was related to alveolar bone loss and, to a lesser extent, to clinical attachment loss, implicating postmenopausal bone loss as a risk indicator for periodontal disease in postmenopausal women. Periodontitis, an inflammatory disease characterized by resorption of the alveolar bone as well as loss of the soft tissue attachment to the tooth, is a major cause of tooth loss in adults. Since loss of alveolar bone is a prominent feature of periodontal disease, severe osteoporosis/osteopenia could be suspected of being an aggravating factor in the case of periodontal destruction. In recent years, there has been increasing interest in the interrelationship between systemic osteoporosis, oral bone loss, tooth loss, and periodontal disease. A growing body of literature has accumulated regarding the role of osteoporosis in the onset and progression of periodontal disease and tooth loss. The association between these two diseases is biologically plausible as well. It has been hypothesized that the breakdown of periodontal tissue may, in part, be related to systemic conditions that also predispose the patient to osteoporosis/osteopenia. However, some other authors , have reported a contrasting, weak and inconsistent association between skeletal bone density and periodontal status in postmenopausal women. Within this perspective, the present study was aimed to investigate the possible association between osteoporosis/osteopenia and periodontal status among postmenopausal women. The study was a cross-sectional, observational evaluation of postmenopausal woman. From June 2009 to October 2009, a total of 60 subjects were recruited from the outpatients department of Oral Medicine and Radiology, JSS Dental College and Hospital, Mysore. The study was approved by the Institutional Review Board of JSS Dental College and Hospital, Mysore. Written informed consent was obtained from each included subject prior to commencement of the study. The presence of at least seven natural teeth to provide a reasonable number of teeth. Women on hormone replacement therapy (HRT)/corticosteroids or chemotherapy and /or radiotherapy. A study population with a range of different levels of both periodontal disease and BMD was intended; therefore, severity of these conditions was not a selection criterion. The included subjects underwent a complete clinical periodontal examination. All of the clinical measurements were performed by a single examiner (VSB) who was unaware of the woman's bone mineral density. Selected individuals were examined for periodontal status by plaque index  (Silness and Loe method) for four sites per tooth (buccal, mesiobuccal, distobuccal, and lingual), gingival bleeding index  (Ainamo and Bay, 1975) on the mesial, distal, buccal, and lingual aspects of the teeth, and probing depth measured by computerized probing system  (The Florida Disk Probe System, Florida Probe, Gainesville, FL, USA) with a constant probing force on six sites per tooth (distobuccal, midbuccal, mesiobuccal, distolingual, midlingual, and mesiolingual), and clinical attachment level (CAL) was automatically calculated by a computer program taking cemento-enamel junction (CEJ) as a fixed reference point. Subjects' mean plaque score, probing depth and CAL were computed for the whole mouth, whereas gingival bleeding and was expressed in percent as number of sites affected to total sites examined. The average density of maxillary and mandibular alveolar bone was recorded by digital radiographic technique. The digital photostimulable storage phosphor (PSP) system  (Digident PSP system, Digident Ltd, Nesher, Israel) was used with the PSP plates loaded in a cassette without intensifying screen and exposed using dental panoramic unit (Orthoslice 1000 C, Trophy, Marne La Vallee, France) in auto exposure mode with a magnification of 1.23. Immediately after exposure, the PSP plates were scanned in the scanner (Combi-X-2000, Digident Ltd, Nesher, Israel) using manufacturer's default settings as advised. Subsequently, the reproduced digital images were transferred to computer for assessment of average density values of maxillary and mandibular alveolar bone. 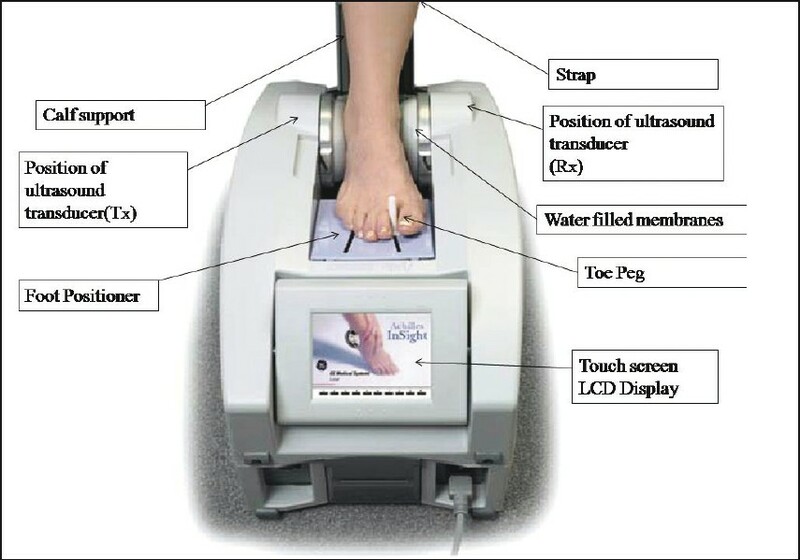 The study used ultrasonometer device (Achilles InSight™ bone ultrasonometer, GE Healthcare, General Electric Company, Lunar, Madison, WI) based on quantitative ultrasound technique  (QUS) to evaluate bone status by measuring stiffness index (SI) , in the heel (calcaneus bone) for the assessment of BMD. The working position and the components of the ultrasonometer are demonstrated in [Figure 1]. The SI has been scaled in such a way to make the young adult value equal to 100. The normalized and scaled BUA and SOS values contributed equally to the resulting SI over the adult age range. The SI was then used to create T-score by comparing to reference figures for a healthy young adult. Thus, the obtained data for T-score and maxillary and mandibular alveolar bone density, and periodontal status were subjected to statistical analysis for correlation and regression procedures. This study included 60 postmenopausal women aged 50-60 years, with a mean (SD) of 55.5 (3.4) years. [Table 1] summarizes the descriptive statistics results. Pearson correlation coefficients between skeletal, alveolar and periodontal parameters are shown in [Table 2]. Maxillary alveolar bone density showed highly significant positive correlation (r=0.898, N=60, P<0.001) with T-score. Mandibular alveolar bone density correlation (r=0.907 N=60, P<0.001) with T-score was also highly significant. 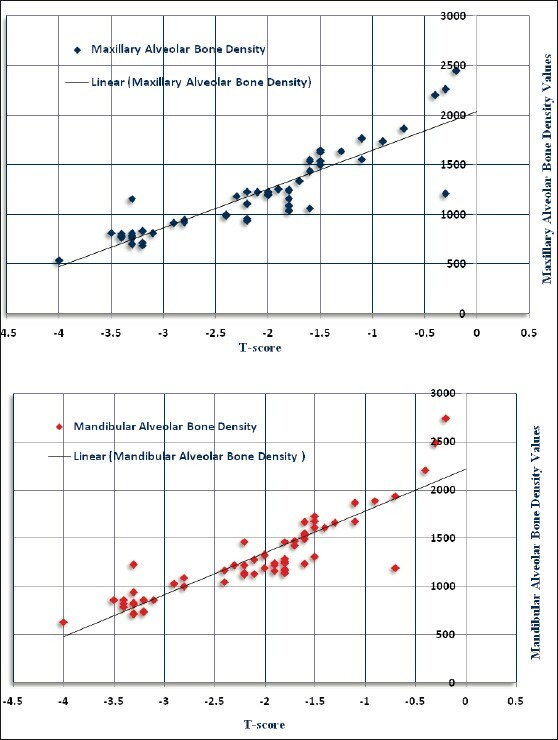 The scattergram for both the maxillary and mandibular [Figure 2] alveolar bone densities shows that the data points are reasonably well distributed along the regression line, in a linear relationship with no outliers. Further, there was a significant negative correlation (r=−0.285, N=60, P<0.05) between plaque score and T-score. Similarly, bleeding index (r=−0.277, N=60, P<0.05), and probing depth (r=−0.316, N=60, P<0.05) also showed a significant negative correlation with T-score, whereas CAL (r=−0.221, N=60, P>0.05) was weakly correlated with T-score, without statistical significance. Multiple regression analyses were conducted to examine the relationship between T-score and CAL with various potential predictors, respectively. The final multiple regression model with predictor variables (maxillary bone density and mandibular bone density) for the dependent variable (T-score) produced R2=0.858, F (2, 57)=171.665, P<0.001. Significant variables are shown in [Table 3]. Adjusted R2 was 0.853; in other words, about 85.3% of the variability for T-score was accounted by maxillary bone density and mandibular bone density. The plaque score, bleeding score, probing depth, and attachment level did not contributed to the multiple regression models. The final multiple model with predictor variables (probing pocket depth, bleeding score and maxillary alveolar bone density) for the dependent variable (CAL) produced R2=0.885, F (3, 56)=144.205, P<0.001. Significant variables are shown in [Table 4]. The final model accounted for 87.9% of the variance of CAL (adjusted R 2 =0.879). The T-score, mandibular alveolar bone density and plaque score did not contributed to the final multiple regression models. The aim of this study was to evaluate the relationship between various periodontal clinical parameters and BMD in postmenopausal women. Our results revealed that there was a significant correlation between maxillary and mandibular alveolar bone densities and calcaneal T-score. Furthermore, our results also suggested the presence of a correlation between periodontal status and calcaneal T-score. A number of studies ,,, have investigated a possible relationship between periodontitis and osteoporosis, and although the literature supports such relationship, its extent remains unclear due to small sample sizes, non-comparable study populations and different study methods used to assess periodontitis and osteoporosis. Moreover, the evaluation of the relationship between osteoporosis and periodontitis is a complicated issue. It can be understood by the fact that both diseases are multifactorial in etiology. Multiple systemic factors influence the progression of osteoporosis, including age, race, diet, gender, hormone therapy, smoking, genetic factors, exercise and body weight. Several of these are also risk factors for severe periodontal disease. Furthermore, local factors, such as bacterial plaque and calculus, may also mask the effect of osteoporosis on periodontal status. Despite the fact that a number of studies support the relationship between osteoporosis and periodontal status, little is known about the mechanism behind such a relationship. Recently, Geurs  summarized the proposed mechanisms to explain a potential relationship between periodontitis and osteoporosis. The possible mechanism by which postmenopausal osteoporosis leads to more periodontal destructions may be the presence of less crestal alveolar bone per unit volume; this bone of lesser density may be more easily absorbed. Estrogen withdrawal following menopause is associated with increased osteoclast numbers due to enhanced osteoclast formation and activity and reduced osteoclast apoptosis. A significant connection between periodontitis and osteoporosis can also be confirmed by the action of proinflammatory cytokines and prostaglandins. Since these mediators develop in both periodontitis  and osteoporosis,  there is a possibility of double connection between these two diseases. Cytokines such as interleukin-1 (IL-1) and interleukin-6 (IL-6), tumor necrosis factor (TNF), as well as prostaglandins (PgE), have a stimulating effect on the bone resorption, since they affect differentiation of osteoblasts from precursor cells. The effect of osteoporosis on periodontitis can be partly explained by the increased number of created proinflammatory cytokines and prostaglandins during osteoporosis. In the present study, we found a strong and significant correlation between calcaneal T-score and alveolar bone density of both the jaws. Previous studies ,,,, have established strong relationships between systemic bone density and alveolar bone density in postmenopausal women belonging to various populations. In a study of 227 postmenopausal women, Klemetti et al. found that women with higher BMDs in the skeleton seem to retain teeth with deeper periodontal pockets more easily than those with osteoporosis. Similarly, Payne et al.,  in a 2-year longitudinal clinical study, compared the alveolar bone height and density changes in 21 osteoporotic/osteopenic women with those of 17 women with normal lumbar spine BMD. The results indicated that osteoporotic/osteopenic women exhibited a higher frequency of loss in alveolar bone height and crestal bone density relative to women with normal BMD. Our results also indicated the same, wherein calcaneal T-score significantly correlated with alveolar bone density. Our result showed there was significant but weak correlation between the clinical parameters of periodontitis (mean probing depth, bleeding score and probing pocket depth) and calcaneal T-score. These findings are in good agreement with those of the authors , who reported a significant relation between systemic osteoporosis and periodontal status in postmenopausal women. A case-control study  comparing 12 osteoporotic fracture women and 14 normal women found that there was significantly greater loss of periodontal attachment in the osteoporotic women than in the normal women. Similar findings were shown in a cross-sectional investigation  of the association between systemic BMD and periodontal status. In this study,  30 postmenopausal, Asian-American women were screened for osteoporosis and chronic periodontitis. Periodontal assessments included tooth loss, plaque index, probing depths, and CALs. Statistically significant negative correlations were found between BMD and tooth loss and BMD and clinical attachment loss, which were independent of plaque scores. In another study,  controlling for known confounders, the relationship between systemic BMD and periodontal disease in 70 postmenopausal Caucasian women aged 51-78 was investigated. The severity of periodontal disease was represented by clinical attachment loss and interproximal alveolar bone loss (ABL). Results showed that mean ABL significantly correlated with BMD. Clinical attachment loss appeared to be weakly related to skeletal BMD consistently at all regions of the skeleton, but the results did not reach the level of statistical significance. We obtained a similar result in this study also, where alveolar bone density significantly correlated with calcaneal T-score but the weakly correlated CAL with T-score could not reach a statistical significance level. In contrast to previous reports, our result is not in agreement with the results of Elders et al.,  wherein no significant correlation between periodontitis and spinal BMD has been reported. Likewise, our result differs from the results of Kribbs  who did not find significant difference between the osteoporotic and non-osteoporotic groups in mean. Similarly, our study does not support an age cohort study  of 70-year-old women, in which no statistically significant differences were found in gingival bleeding, probing pocket depth, gingival recession and marginal bone level between 15 women with osteoporosis and 21 healthy subjects. Until recently, HRT was used in the prevention and treatment of osteoporosis. One recent study  reported a higher likelihood of periodontitis among postmenopausal women not taking HRT compared with premenopausal women (64.4% vs. 46.3%, P= 0.005). Alveolar bone density and crestal height increased among women taking HRT and/or calcium supplements, which correlated with changes in systemic BMD. This was not a factor in the present study since women taking HRT were excluded from the study. Numerous investigators ,, have utilized dental radiographs to compare the ABL with the BMD of skeletal sites. In the previous studies, ,, interproximal ABL was measured from the cemento-enamel junction to the most coronal aspect of the interproximal alveolar bone for each tooth on the mesial and distal sides from the radiographs. The change was considered for correlating with BMD of skeletal sites. In the present study, we used computer auto generated BMD values for maxillary and mandibular alveolar bone for correlation with BMD of skeletal sites. Previous studies ,, used dual energy X-ray absorptiometry (DEXA) to measure BMD, as this instrument uses a very low level of X-rays produced by an X-ray cathode, to estimate bone mineral content. Recently, QUS ,, methods have been introduced for the assessment of the skeletal status in osteoporosis. Thus, with the advent of ultrasound, it is now possible to measure bone density with a small, portable ultrasound unit designed exclusively for bone density testing. It has been suggested that QUS may provide information about not only bone density but also the micro-architecture and elastic properties of bone. Furthermore, ultrasound is a mechanical wave with no known biological effect and is safe (it uses no ionizing radiation) at the intensities used clinically. , Currently, all of the QUS machines have intensities below the maximum levels imposed by the US Food and Drug Administration (FDA). Thus, in the present study, we used QUS to measure BMD. Given the cross-sectional design employed, our findings reflect the cumulative effects of disease processes and prevent the establishment of causal relationships; longitudinal studies would be valuable in establishing a temporal association between systemic and oral bone loss. Therefore, future research should continue to evaluate specific associations between osteoporosis and periodontitis, the temporality of these factors and include subpopulations that are at increased risk. This knowledge may form the basis for targeting preventive and therapeutic measures to individuals at greatest risk for both diseases. We can thus conclude that systemic bone loss may be a risk indicator for periodontal destruction. A well-designed, large-scale study to determine the role of osteopenia on the prevalence and severity of periodontal disease, and a prospective study to determine whether osteopenia is also associated with the incidence and progression of periodontal disease are needed. Also, intervention studies may be helpful to justify modification of BMD as an approach for the management of periodontal disease. The results of the studies of the relationship between periodontal disease and BMD have a practical significance in the diagnosis, prevention, and treatment of both the diseases. The authors express their gratitude to Dr. Karthikeya Patil (Professor and Head) and Dr. Mahima VG (Professor), Department of Oral Medicine and Radiology, JSS Dental College and Hospital, Mysore, for their support in providing the facility of digital radiography used in the present research work. 1. Adams JE. Osteoporosis and bone mineral densitometry. Curr Opin Radiol 1992;4:11-20. 2. Greendale GA, Lee NP, Arriola ER. The menopause. Lancet 1999;353:571-80. 3. World Health Organization. Assessment of fracture risk and its application to screening for postmenopausal osteoporosis. Report of a WHO Study Group (Technical reports series). Geneva: WHO; 1994. p. 1-129. 4. Wactawski-Wende J, Grossi SG, Trevisan M, Genco RJ, Tezal M, Dunford RG. The role of osteopenia in oral bone loss and periodontal disease. J Periodontol 1996;67:1076-84. 5. Taguchi A, Tanimoto K, Suei Y, Otani K, Wada T. Oral signs as indicators of possible osteoporosis in elderly women. Oral Surg Oral Med Oral Pathol Oral Radiol Endod 1995;80:612-6. 6. Weyant RJ, Pearlstein ME, Churak AP, Forrest K, Famili P, Cauley JA. The association between osteopenia and periodontal attachment loss in older women. J Periodontol 1999;70:982-91. 7. Elders PJ, Habets LL, Netelenbos JC, Van der Linden LW, Van der Stelt PF. The relation between periodontitis and systemic bone mass in women between 46 and 55 years of age. J Clin Periodontol 1992;19:492-6. 8. Loë H, Silness J. Periodontal disease in pregnancy. I. prevalence and severity. Acta Odontol Scand. 1963;21:533-51. 9. Ainamo J, Bay I. Problems and proposals for recording gingivitis and plaque. Int Dent J 1975;25:229-35. 10. Barendregt DS, Van der Velden U, Timmerman MF, van der Weijden GA. Comparison of two automated periodontal probes and two probes with a conventional readout in periodontal maintenance patients. J Clin Periodontol 2006;33:276-82. 11. Benediktsdottir IS, Hintze H, Petersen JK, Wenzel A. Image quality of two solid-state and three photostimulable phosphor plate digital panoramic systems, and treatment planning of mandibular third molar removal. Dentomaxillofac Radiol 2003;32:39-44. 12. Mondry A, Hetzel GR, Willers R, Feldkamp J, Grabensee B. Quantitative heel ultrasound in assessment of bone structure in renal transplant recipients. Am J Kidney Dis 2001;37:932-7. 13. Holi MS, Radhakrishnan S, Swaranamani S, Jayavelan NA. Quantitative ultrasound technique for the assessment of osteoporosis and prediction of fracture risk. J Pure Appl Ultrason 2005;27:55-60. 14. Alenfeld FE, Engelke K, Schmidt D, Brezger M, Diessel E, Felsenberg D. Diagnostic agreement of two calcaneal ultrasound devices: The Sahara bone sonometer and the Achilles+. Br J Radiol 2002;75:895-902. 15. Nicopoulou-Karayianni K, Tzoutzoukos P, Mitsea A, Karayiannis A, Tsiklakis K, Jacobs R, et al. Tooth loss and osteoporosis: The osteodent study. J Clin Periodontol 2009;36:190-7. 16. Krejci CB, Bissada NF. Women's health issues and relashionship to periodontitis. J Am Dent Assoc 2002;133:323-7. 17. Pilgram TK, Hildebolt CF, Dotson M, Cohen SC, Hauser JF, Kardaris E, et al. Relationships between clinical attachment level and spine and hip bone mineral density: Data from healthy postmenopausal women. J Periodontol 2002;73:298-301. 18. Wactawski-Wende J, Hausmann E, Hovey K, Trevisan M, Grossi S, Genco RJ. The association between osteoporosis and alveolar crestal height in postmenopausal women. J Periodontol 2005;76:2116-24. 19. Black DM. Why elderly women should be screened and treated to prevent osteoporosis. Am J Med 1995;98:67-75. 20. Kinane DF, Peterson M, Stathopoulou G. Environmental and other modifying factors of the periodontal disease. Periodontol 2000 2006;40:107-19. 21. Geurs N. Osteoporosis and periodontal disease. Periodontol 2000 2007;44:29-43. 22. Reinhardt RA, Payne JB, Maze CA, Patil KD, Gallagher SJ, Mattson JS. Influence of estrogen and osteopenia/osteoporosis on clinical periodontitis in postmenopausal women. J Periodontol 1999;70:823-8. 23. Masada MP, Persson R, Kenney JS, Lee SW, Page RC, Allison AC. Measurement of interleukin 1 alpha and beta in gingival crevicular fluid: Implications for pathogenesis of periodontal disease. J Periodontal Res 1992;25:156-63. 24. Romas E, Martin JT. Cytokines in the pathogenesis of osteoporosis. Osteoporos Int 1997;7:47-53. 25. Lang PN, Karring T. Proceedings of the 1st European Workshop on Periodontology. London: Quintessence Publishing Co. Ltd.; 1993. p. 13-5. 26. Mohammad AR, Hooper DA, Vermilyea SG, Mariotti A, Preshaw PM. An investigation of the relationship between systemic bone density and clinical periodontal status in post-menopausal Asian-American women. Int Dent J 2003;53:121-5. 27. Klemetti E, Collin HL, Forss H, Markkanen H, Lassila V. Mineral status of skeleton and advanced periodontal disease. J Clin Periodontol 1994;21:184-8. 28. Payne JB, Reinhardt RA, Nummikoski PV, Patil KD. Longitudinal alveolar bone loss in postmenopausal osteoporotic/osteopenic women. Osteoporos Int 1999;10:34-40. 29. Von Wowern N, Klausen B, Kollerup G. Osteoporosis: A risk factor in periodontal disease. J Periodontol 1994;65:1134-8. 30. Tezal M, Wactawski-Wende J, Grossi SG, Ho AW, Dunford R, Genco RJ. The relationship between bone mineral density and periodontitis in postmenopausal women. J Periodontol 2000;71:1492-8. 31. Kribbs PJ. Comparison of mandibular bone in normal and osteoporotic women. J Prosthet Dent 1990;63:218-22. 32. Lundstrom A, Jendle J, Stenstrom B, Toss G, Ravald N. Periodontal conditions in 70-year-old women with osteoporosis. Swed Dent J 2001;25:89-96. 33. Haas AN, Rosing KC, Oppermann RV, Albandar JM, Susin C. Association between menopause, hormone replacement therapy and periodontal attachment loss in southern Brazilian women. J Periodontol 2009;80:1380-7. 34. Parks ET, Williamson GF. Digital radiography: An overview. J Contemp Dent Pract 2002;4:23-39. 35. Hilde bolt CF. Osteoporosis and oral bone loss. Dentomaxillofac Radiol 1997;26:3-15. 36. White SC. Oral radiographic predictors of osteoporosis. Dentomaxillofac Radiol 2002;31:84-92. 37. Suresh S, Kumar T, Saraswathy PK, Pani Shankar KH. Periodontitis and bone mineral density among pre and post menopausal women: A comparative study. J Indian Soc Periodontol 2010;14:30-4. 38. Hausman E, Allen K, Carpio L, Christersson LA. Computerized methodology for detecting of alveolar creastal bone loss from serial intraoral radiographs. J Periodontol 1992;63:657-62. 39. Hildebeolt CF, Rupich RC, Vannier MW, Zerbolio DJ Jr, Shrout MK, Cohen S, et al. Inter relationships between bone mineral context measures: Dual energy radiographty (DER) and bitewing radiographs (BWX). J Clin Periodontol 1993;20:739-45.